Death Apr 12, 1872 Worcester, Worcester Co., MA, USA, 67 yrs. 1 mo. Samantha Bates married Asahel Fairbank, son of Jonathan Fairbank and Lydia Foster, in Apr 2, 1829. Elbridge Fairbank married Ellen E. Adams in Jun 23, 1874. Ellen E. Adams married Elbridge Fairbank, son of Asahel Fairbank and Samantha Bates, in Jun 23, 1874. George H. Fairbank married Sarah C. Edwards in Jun 15, 1863 at Worcester, Worcester Co., MA, USA. George H. Fairbank and Sarah C. Edwards were divorced She remarried Erastus M. Eldredge. George H. Fairbank married Susan S. Tyler in May 15, 1876. Sarah C. Edwards married George H. Fairbank, son of Asahel Fairbank and Samantha Bates, in Jun 15, 1863 at Worcester, Worcester Co., MA, USA. Sarah C. Edwards and George H. Fairbank were divorced She remarried Erastus M. Eldredge. Annie M. Fairbank married Herbert W. Searle in Oct 19, 1885 at Worcester, Worcester Co., MA, USA. Herbert W. Searle married Annie M. Fairbank, daughter of George H. Fairbank and Sarah C. Edwards, in Oct 19, 1885 at Worcester, Worcester Co., MA, USA. Susan S. Tyler married George H. Fairbank, son of Asahel Fairbank and Samantha Bates, in May 15, 1876. Stephen Cheston Houghton married Sophia E. Cluskey. 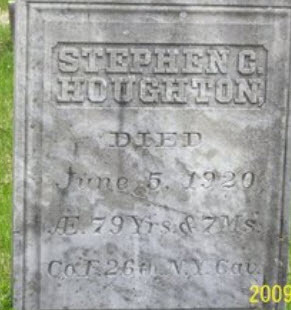 Stephen Cheston Houghton married Ann E. Cluskey in Mar 2, 1871 at Bakersfield, Franklin Co., VT, USA, age 30; also Feb. 3, 1877. Stephen Cheston Houghton and Ann E. Cluskey were divorced on May 8, 1876 at VT, USA, She initiated for intolerable severity; Vol. 2, p. 10. 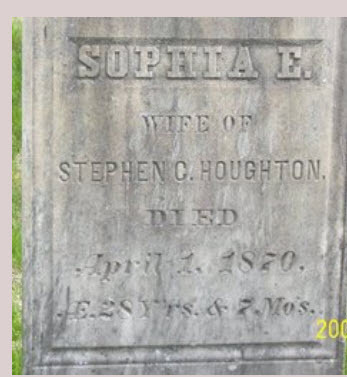 Sophia E. Cluskey married Stephen Cheston Houghton, son of Capt. Joel Houghton and Lucy Wilder Houghton. Marriage Mar 19, 1892 Barre, Washington Co., VT, USA, he age 23, a quarryman; she was pregnant. William Harrison Houghton married Lucia A. Mead in Mar 19, 1892 at Barre, Washington Co., VT, USA, he age 23, a quarryman; she was pregnant. Lucia A. Mead married William Harrison Houghton, son of Stephen Cheston Houghton and Sophia E. Cluskey, in Mar 19, 1892 at Barre, Washington Co., VT, USA, he age 23, a quarryman; she was pregnant. Ida Mae Houghton married William Edward Huntoon in Jun 27, 1913 at Northfield, Washington Co., VT, USA, age 20. Ida Mae Houghton and William Edward Huntoon were divorced. Clyde Mead Houghton married Adelaide Jane Studley. Adelaide Jane Studley married Clyde Mead Houghton, son of William Harrison Houghton and Lucia A. Mead. Adelaide Jane Studley married Roy W. Stinson in Nov 9, 1919 at ME, USA, age 21 and 23. Jacquelyn Franeda Young married John Joseph Brugnoni in Dec 15, 1956. Jacquelyn Franeda Young and John Joseph Brugnoni were divorced in 1971. Jacquelyn Franeda Young married Charles Comi in 1989. Charles Comi married Jacquelyn Franeda Young, daughter of Peter Francesco Christian Mauti Young and Dorothea Carlene Huntoon, in 1989. Charles Williams married Eliza Houghton in Jul 21, 1814. Eliza Houghton married Charles Williams in Jul 21, 1814. Ida Clara Cochran married Edwin S. Haughton in circa 1883 Mar 17 y in 1900 census. Edwin S. Haughton married Ida Clara Cochran in circa 1883 Mar 17 y in 1900 census.